Discussing Jean Eustache and his fellow French filmmakers who came of age during the German Occupation, the filmmaker and perspicacious critic Luc Moullet once noted their “reverence for grandparents and a rejection of the father and mother—a crisis that fertilized a number of artistic careers.” The same sentiments catalyzed West German art in the late 1960s and ’70s; for the pioneering figures of both New German Cinema and Krautrock, or Kosmische Musik, or whatever your preferred label, have tended to agree on some level with Werner Herzog’s pronouncement: “We are a nation without fathers.” This was literally true in the case of Herzog, abandoned as a boy, though it speaks metaphorically to a generation eager to bypass the transgressions of their fathers to reconnect with the avant-garde spirit that came of age in the 1910s and ’20s. 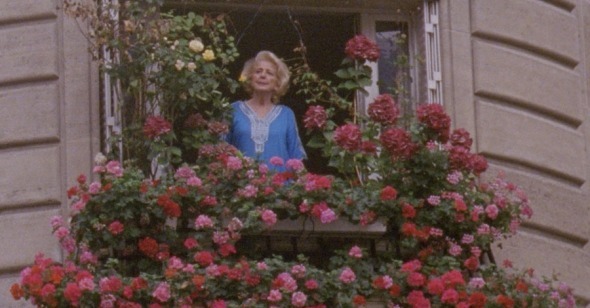 What does any of this have to do with Sofia Bohdanowicz’s Maison du Bonheur, a portrait of a 77-year-old widowed Parisian astrologer named Juliane Sellam, who has lived in the same Montmartre flat for the last half-century? Just that something of this same reverence for—or at least fascination with—the grandparents’ generation animates Bohdanowicz’s body of work, which I was introduced to by a trilogy of 2013 short films, Modlitwa (A Prayer), Wieczór (An Evening), and Dalsza Modlitwa (Another Prayer). The “star” of these shorts is Bohdanowicz’s own maternal grandmother, Maria, encountered in the first film as a physical presence in her home in suburban Etobicoke; in the second film, a survey of the effects left behind following the grandmother’s death, as a structuring absence; and in the third, a combination of the materials of both, resurrecting the departed as a phantom-like presence. Her short 2016 feature Never Eat Alone features her paternal grandmother, Joan Benac, playing herself, assigning her granddaughter to recovering footage of a television show she appeared on in the early 1950s, as well as the long-lost love interest she appeared alongside. In Maison du Bonheur, Bohdanowicz leaves her immediate family behind; Sellam, we learn through the filmmaker’s opening voiceover, is the relation of a colleague—the two women had neither met nor even spoken on the phone prior to Bohdanowicz’s packing up several rolls of 16mm film and traveling to stay with Sellam in July 2015. Bohdanowicz’s narration, which recurs throughout the film, places the viewer in the position of a confidante. Rather than presenting the film as a polished product, she allows the seams to show, recording her initial plans for the film, or lack thereof, her anxieties about its viability, and her reservations about the finished product. (“All of these memories, sounds, and colors,” she frets over the film’s closing, “Would thy form a story?”) Before Sellam appears, Bohdanowicz allows us to hear her giving instructions to her unseen subject. “We won’t hear my voice,” she says of the finished product—inaccurately, of course, “So it’s important to answer me in complete sentences.” In a rare, narration-free scene in which Sellam is seen working her way through a cream and meringue pastry in a series of small, punctilious bites, the whirring of the Bolex is distinctly audible, and later, when Sellam, her younger sister, and her brother-in-law make a toast over a meal of terrines, Bohdanowicz shows herself shooting a retake after admonishing Sellam not to address the camera. These behind-the-scenes glimpses, dispelling any fly-on-the-wall illusion, have become rather commonplace in contemporary documentary, but in the case of Maison du Bonheur the approach seems to have been struck on not to show membership in any sort of movement, but as a reciprocal gesture—Sellam allows the filmmaker, in a succession of static frames, to record the myriad private processes of her quotidian routine, so it is only fair that Bohdanowicz should in turn reveal something of how she goes about practicing her craft. With Bohdanowicz, we step into Sellam’s apartment in a handsome building of the Haussmannian vintage, the extreme public works makeover of the mid-19th century, which essentially gave the city the face it wears today. Sellam herself seems to keep something of the bright, shiny, reborn Paris of the prosperous postwar years alive in her domestic space. She is an everyday aesthete, and her orderly existence, as divided into a series of intent, process-oriented set pieces by Bohdanowicz, becomes a little hymn to the private pleasures of cultivation. Speaking in her high, piping voice, Sellam provides a running narration to each of these contained segments. She discusses the flowers that bedeck her balcony, bunched with geraniums, roses, and hortensias—the difficulty and unpredictability of their upkeep, and the rewards. This cascade of color is the face that Sellam presents to the world, the concluding images of Maison du Bonheur, and in all things she is conscious of presentation. We see her next at her toilette, applying the full face of makeup without which she refuses to leave the house. She will be viewed having her coiffure tended to by Manouk, her stylist of some 30 years, and sitting for a mani-pedi, in voiceover recalling her Uncle Jacques, a representative of a nail polish company. A word she returns to time and again is “Coquetterie”—the little vanities that for Sellam are very serious business. Sellam and her personal philosophy are at the center of Maison du Bonheur, though the filmmaker herself plays a valuable offscreen supporting role. Bohdanowicz is, we learn, a native Torontonian, but she speaks good French—in fact she speaks only French in her narration of the film—a notable cut above your average Ontario public school language requirement. That she has some prior experience of life in the Francophone world is established in the film’s opening monologue. “The last time I was in France,” she says, “I had a bit of a rough time.” This is left hanging, as it were, until the movie enters its home stretch. While the visuals painstakingly document Sellam’s preparation of an angel food cake, an overlaid audio track lets us hear Sellam reading Bohdanowicz’s astrological chart, extrapolating essential information about her personality from the position of the planets on the date of her birth, Thursday, July 25, 1985. The subject has now become the observer, and Sellam diagnoses her subject as gifted with intuition, a tendency toward perfectionism and morbid over-thinking, and extreme sensitivity. This potent string of associations, communicating something unmistakable while saying nothing much at all, suggests something singularly cinematic about astrology, an analogy between the evocatory power of a horoscope—those loose generalities offered in such a way as to seem custom fit, to prompt that “Yes, that’s exactly like me” reaction—and the associative power of editing that creates meaning in juxtaposition. Whether or not one agrees with Pauline Kael’spronouncement that Agnès Varda’s Cléo from 5 to 7 (1962) is “one of the few films directed by a woman in which the viewer can sense a difference,” one is hard-pressed to think of many men who would open a film, as Varda does, with a crucial Tarot reading. Like the domiciliary rituals that Maison du Bonheur so lovingly records, astrology has traditionally been considered part of the women’s world—though Sellam’s own mentor was a man, who claims to have been an astrologer for no less a personage than the patriarch of the Fifth Republic, Charles de Gaulle. We learn a few things of Sellam’s backstory, but much is touched on only fleetingly, not elaborated, or left to inference, for Bohdanowicz’s habit of withholding extends past the bounds of her own story. There is no discussion of the death of Sellam’s husband, or her mourning. A glimpse at Sellam’s driver’s license is the only indication that she was born in Tunisia when the country was a French protectorate, and overseeing her in that practice of her regular ritual of baking loaves of challah bread for Shabbat is the only reference to her Judaism. That this woman is a colonist who lived through the collapse of the French colonial empire and a European Jew who lived through the attempted extermination of European Jewry would for many filmmakers be considered the essential facts of her life, the core that one must peel back all of the “unimportant” trifles in order to gain access to. The emotional intelligence of Bohdanowicz’s approach, however, is exemplified in her embrace of a central paradox, a belief in the profundity of frivolities, the imperative import of artifice, and an understanding that little rituals altogether form an armature that protects one through life’s travails. There’s no reason to think that Bohdanowicz’s attraction to her grandmother’s generation amounts to a rejection of her mother’s, as in the case of Herzog and his “fatherless” Germans; Baby Boomers may technically have presided, thumb-twaddling, over the fatal toxification of the planet and enjoyed the last best moments of widespread prosperity as a birthright, but in the main they weren’t conscious architects of genocide, and that’s got to count for something. What she is looking for here is a certain attention to the graciousness of living that has no single generational provenance but relies on human touch and careworn shared history very far from catalog coziness or the marketing of “Hygge.” Almost requisite when addressing any cinematic depiction of housework is a reference to Chantal Akerman’s Jeanne Dielman, 23 quai du Commerce, 1080 Bruxelles (1975), the Alpha and Omega of domestic labor movies, but Bohdanowicz’s film, with its elevation of household rites and its positioning of the filmmaking process as a species of “housework,” connects both to Akerman’s work and the efforts of an approximate contemporary like Jodie Mack, with her creation of labor-intensive handicraft collage cinema. The movie amounts to an enshrining of what have sometimes disdainfully been called “bourgeois comforts,” but in an age where the prevailing creeds seem to promise only ever more widespread and ever deepening immiseration, the value of bourgeois comforts and hearth and home and the basic dignity that they confer have never been so in need of enumeration and celebration. In today’s mephitic atmosphere, an assertion of the sanctity of simple domestic pleasures—of pleasure itself—is tantamount to an act of artistic resistance. It is in the same spirit that Kate Wagner, the writer who documents the nightmarish architectural results of the collision of too much money and too little taste at the website McMansion Hell, responds to the appalling spectacle of contemporary American politics by flooding her social media feed with images of appealing Sears kit homes and bungalows and ranch-style houses, what she calls a “HAPPY HOUSE THREAD.” In a world on the brink, Maison du Bonheur becomes a redoubt. Bohdanowicz’s movie, and her subject, are out of step with contemporary life, but they provide a window on a very different kind of possible contemporary life, one in which—to borrow from the overture that opens Orson Welles’s The Magnificent Ambersons (1942), that eulogy for the passing of gentility from American life—there is “time enough for everything.” The painstaking care that Bohdanowicz herein records was echoed in the making of Maison du Bonheur. I happen to know that she processed the film shot for the movie herself, and though it is impossible to say what special qualities this DIY approach confers on the finished product, it does have a sort of aura about it that bespeaks tender affection. It is a work made with discipline and scrupulous artistry, and a warm, welcoming movie, one that I believe my mother would have watched with great pleasure—a statement that I make with the very tenderest esteem.